The Recession has been hard on the city of Detroit. With the Motown Sound faded into memory, the soul of Detroit has been left restless and wanting. Comfort would only come in the form of big name, outside performers. However, as my Star Wars friends would say, “I Feel a disturbance in the Force” and it is much-needed! That “Disturbance” presents itself in the form of the combined strength of four powerful authors. 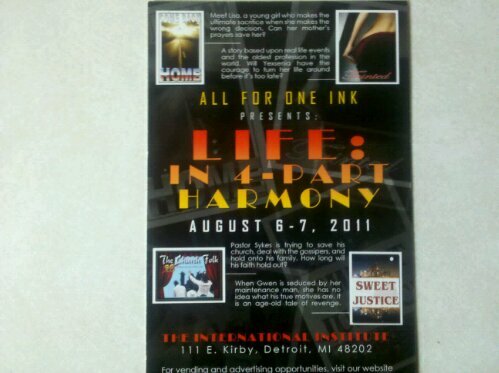 On August 6th and 7th Tony Omar, Octavia”The Writer”Lesley, Monica Link, and Sylvia Hubbard will bring to you: “Life: In 4-Part Harmony”. Four short stories of murder, mayhem, and intrigue brought to you all in one night. At $20 a ticket or 2 for $30, it is an outing you can’t refuse. Four of Detroit’s best authors putting on a play? I am planning on being there! How about you? Holla if you hear me! Posted on July 13, 2011 by KELLY GREENE	• This entry was posted in People. Bookmark the permalink. Thank You!! We have to support our local artist! They have a lot of books to their credit. The plays ought to be awesome!